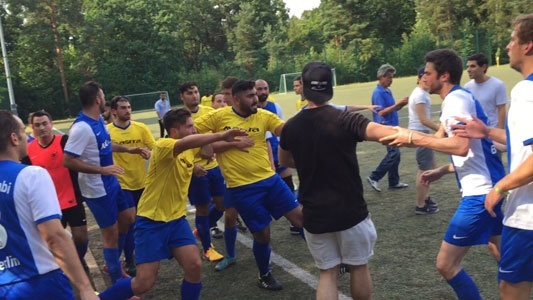 Berlin - An amateur football match in Berlin descended into a mass brawl that left two people injured after fans and players from both teams exchanged anti-Semitic and anti-Muslim insults, German police said on Monday. A police spokesman said the trouble started when a fan of TuS Makkabi, a Berlin-based Jewish club, insulted a player from the rival team BFC Meteor during Sunday’s match. The dispute ended in a tussle involving more than 20 people, forcing the referee to cancel the match. “According to witnesses, there were insults from both sides, so there were anti-Semitic as well as anti-Muslim insults,” the spokesman said. Police have started preliminary proceedings against four men involved in the brawl for insult, bodily harm and civil disorder. Spokespeople from TuS Makkabi and BFC Meteor could not immediately be reached for comment. Germany is home to the world’s fast-growing Jewish population and only last month Berlin proudly hosted the 14th European Maccabi Games, or “Jewish Olympics”—an important feat for the country responsible for the Holocaust in which six million Jews were killed during World War Two. However, Jewish groups report a rise in attacks against Jews in Berlin and other German cities, often involving young men with Turkish and Arabic roots. BFC Meteor is based in the Berlin district of Wedding, which has a large population of ethnic Turkish and Arab origin. Muslims will ALWAYS be anti-Semitic no matter what or where, proof is Obama.